Tips To Survive The Heat. Summer is here! Let's beat the heat wave with some surprising tips to stay cool when the temperature soars. • Store chilled water in a spray bottle: Store water in a spray bottle and refrigerate it. Whenever the heat gets to you, reach for your water spray and mist yourself with the refreshing spritz of chilled water. • Cool Your Pulse: Wrap ice cubes in a hand towel and individually place them on your pulse points like the wrist, neck, knees and inner elbows. These are the body's quickest cooling points. • Hang wet sheets: When the temperature is too hot outside, move your window curtains and hang wet sheets. Air blowing from the outside passes through the wet sheets and creates a cooling effect. • Change your lightings: Ceiling and table light fixtures tend to emit heat. Keep them turned off as much as possible. Switch on to fluorescent or LED bulbs that emit less energy and heat. • Drink water: Drink plenty of water to survive the heat wave. Make a refreshing beverage by adding few sprigs of mint. Water tastes even more refreshing and creates a cooling sensation. • Stop fanning yourself: Are you one of those trying to cool yourself by fanning. Fanning actually needs energy and will make you feel hotter. Instead, relax and avoid moving around much. • Take a cool shower: Soak yourself in a bath tub with cold water. This act will considerably cool your body. You can continue the refreshing soak till you feel relaxed. • Avoid alcohol: It's true that you may be tempted to indulge in some cool cocktail or a mug of chilled beer, though it's really not going to cool you off. Alcohol tends to dehydrate you. Avoid your temptation and stick to flavored water and fresh fruit juices to keep you hydrated. • Enjoy a spicy meal: We Indians enjoy spicy food! Ever thought why the populations in hotter places consume spicy food? The best example is the Andhra food! The component capsaicin in chillies and peppers increases perspiration and sweating and this in turn cools your body. • Take a break: You can also beat stress and the heat of summer by heading to the nearest hill station with your family and friends. Keep away from heat and stay cool. 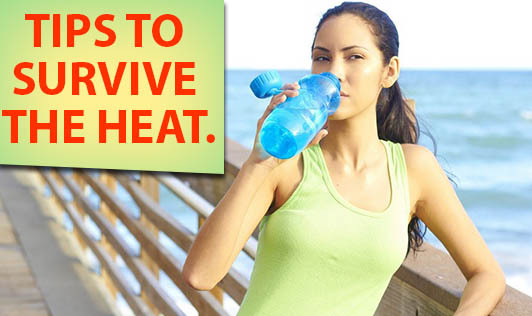 Also, share with us some more tips on how you beat the heat!